David B. Ratterman is a member of the Construction Service Group at Stites & Harbison, PLLC. A general construction law expert specializing in the fabricated structural steel industry, Ratterman has developed a national legal practice and advanced the study and practice of construction law in the United States. He has also become an internationally recognized writer and speaker on a wide variety of legal and engineering topics. Ratterman’s immersion in the construction industry began at age 10, as a water boy on construction projects, and evolved through a series of engineering and construction positions with state government, private industry and the U.S. Navy, from which he retired as a commander in the United States Navy Reserve. 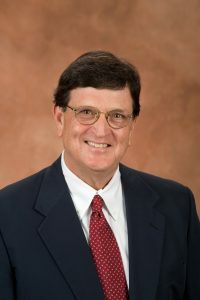 In addition to a bachelor’s degree from the University of Kentucky, earned through a scholarship in mechanical engineering, Ratterman holds a master’s degree in business administration and a Juris Doctor. A pioneer in construction law in the United States, Ratterman has been lead trial counsel for numerous contractors, design professionals, material suppliers and construction owners involved in complex matters of litigation, arbitration and construction mediation. Formally trained as a construction arbitrator and mediator and listed on several national construction neutral panels, Ratterman has participated as an ADR neutral or advocate in resolution of construction disputes totaling well in excess of $500 million. He was also an advisor to the Federal Emergency Management Agency task forces that investigated the September 11, 2001 collapse of the World Trade Center towers. Ratterman has served as secretary and general counsel of the American Institute of Steel Construction since 1989 and also serves on that body’s Code of Standard Practice committee and as counsel to its National Steel Bridge Alliance. He has been an officer or advisor to 12 industry trade organizations and professional societies involved in the fabricated structural steel industry in the United States. Ratterman is a Life Fellow of the American Bar Foundation and a Fellow and former Governor of the American College of Construction Lawyers. In 2014 he was awarded the Past Presidents’ Award for exemplary service to the American College of Construction Lawyers, only the third Fellow to receive this distinction in the history of the organization. He was the founder and first chair of the Kentucky Bar Association section on construction and public contract law. Among his industry and service honors, Ratterman has been recognized by Best Lawyers in America, America’s Leading Lawyers in Business, Kentucky Super Lawyers, and Chambers USA. In 2012 the American Institute of Steel Construction created a college scholarship program in Ratterman’s honor that provides eleven college scholarships annually to children of employees in the fabricated structural steel industry in the United States. He is currently serving as president of the University of Kentucky Alumni Association and he received a Distinguished Service Award from the association in 2012, which recognizes those individuals who have provided extraordinary service to the University of Kentucky and its alumni association. Ratterman lives in Louisville with his wife, Lois. He has one son, one daughter and four grandchildren.